Another fine day in the RV-Maybe an end in sight? I had another baking day in the RV. I baked a 100% whole wheat miche. I didn't use a recipe this time. Simply modified a "1-2-3" method, making it into a my own. 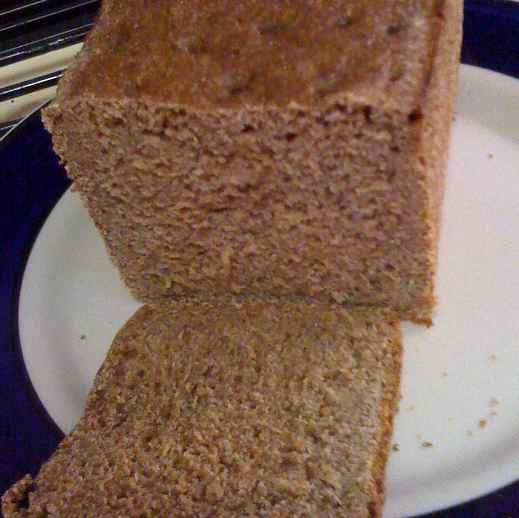 I used 150 grams whole wheat starter, (100% starter) 375 grams water and 450 grams whole wheat flour. 2% salt. I mixed until it came off the sides of the mixer in the Kitchen aid. This was an incredibly stretchy dough, I guess because of the very high hydration! Certainly don't believe that whole wheat is low in gluten because it isn't true!! I calculate the hydration of this at a whopping 85% when including the starter. Can this really be right? When doing my folds, I could literally stretch this baby about 18 inches each direction on the first set of s/folds!! It was pretty amazing. I did three sets of s/f's, 1 hour apart. Fermentation time was 10 hours, shaped and 1 hour later I baked. It actually held it's shape pretty well, only flattening slightly. What a nutty flavor, crispy crust and incredibly open crumb for a WW loaf! Nice! I might try the same in a loaf pan and see what I get in the way of a sandwich bread next time. The same night, I made a 75% rye, 25% spelt loaf, using Mini's favorite rye formula and my Pullman pan. Spices were dried onion, caraway and anise at a scant tablespoon each. I've found that the exact amount that Mini uses for her big pot works for my Pellman pan. How easy is that? I also found this time that it is the perfect overnight recipe, needing no shaping at all! I put it directly into the Pullman pan at 5:30 in the evening and baked at 3:30 AM. Although Mini says this will self-destruct in 8 hours mine held up for a full 10 and came out absolutely perfect. Rose to the top of the pan, held up, had a small amount of oven spring and with the spelt had a slightly milder, nuttier taste than the 100% full rye that I made a couple of weeks ago. I'm making plans to start my Hamelman's baking challenge. I'll be starting with something from the levain chapter and something from the rye chapter. I'm waiting on an order of flour and a couple of days off in a row. Perhaps I'll start a levain tonight if I get extra motivated, we'll see. Looking at about another month in this little camper. Starting to get some cabin fever. It's been an experience, that's for sure! Hmmmmm Wonder what you baked that bread with. I tried quite a few bread recipes in my coach with a high end micro/convection oven and never got a decent loaf. I did try a cibatta in a La Cloche Clay baker. It did fair but not a good crust. Max pre heat I can get is 450 degrees. Be nice to talk about this. I put in a large stove/oven in my casita here in the resort for baking. Will be on the road for 5 months starting 6-1 and a nice loaf of baked bread would be nice. I preheated the little gas oven to as high as it will go. I have a big brick "stepping stone" on the bottom. This is the key. It helps it to get some thermal mass. I put that in months ago, when we first started living in the RV in December. It's a 12X12, about 3" tall brick that Home Depot sells for the garden. I put it in the bottom of the oven and leave it there. I also wrapped the baking shelf with aluminum foil as I was burning the bottoms of everything before the middle/top was done. That made a huge difference. No stone as the stone didn't allow air flow around it. After that, tons of steam, only with a spray bottle as there is no room on the bottom for a steam pan after adding the brick. I get adequate crust and my loaf breads are excellent. I'll wait to improve my artisan breads for when I get back in the house. My ryes come out fantastic. Covered is the way to go if you have a cloche. I bake at least two loaves a week, plus lots of other goodies. You can do it! Plus, learn to use your grill for flat breads and pizza. I also use it for roasts. Learn how to get it at different temps-350, 400, 450 and 500. You can do alot in your grill to free up your oven space. Hi Doc I used to have a gas oven/stove in the first coach I had owned I built from the ground up 4104 and a 4106. Then into ma wanderlodge and it had a gas oven and stove also. Now I have a Monaco exe. and no gas except for a 2 burner stove. Smal grill I use for steaks or what ever. I am now only 6 months on the road and the other six months here at the resort where I put in a house type stove oven and it works great. We have been most of the been full since 1987. Lived on the boat New England waters in the summer and coach in the winter. Where are you located and what are travel plans for the summer? Here is a pix of my lot will leave 6-1 and stay out west this year fuel getting to be to expensive at 1.00 per mile and up for me. The table was set up for some guests. The Bed is a pull down murphy bed. Bath /Shower. Hot weather till I leave will stay in the az room. Easier to cool than this piece of plastic crap I bought by mistake. Not sure if its just a handle Doc for you or you were MD. My Katherine retired MD. I had small air taxi company in Ct I was Chief Pilot Multi Engine Comercial rating and instrument rated single pilot. Medical management for 20 plus years also. Plus many other ventures. Now I just want to live a few more years. I'm an Urgent care/FP physician. (DO). We're actually camping in our frontyard due to a housefire in December. But, here in Mesa/AZ we're all the fashion. Or, we were until about 2 weeks ago when all the snowbirds flew the coop because it was time to turn on the AC. Now we're probably the only ones left staying in an RV for the warmer months. Hopefully, I'll be baking in my new house soon. In the meantime, I just keep playing with my little toy gas oven. Today I'm thinking about trying out the gas grill for pizza with fresh mozarella cheese if I can find a place that sells rennet. If not, I'm going to pull out my brand spanking new pasta roller for my Kitchen Aid and make fresh pasta for dinner. Have a load of donut dough rising on the counter now. Trying my hand at baked donuts. If nothing else I can braid it and make pulla bread. Looks like a nice dough. Hmmmmmm Well we are not to far from you. In Surprise at Happy Trails Resort. Been full time since 1987. Will not leave till 6-1 . Maybe we can get to gether for coffee or what ever. Slows down here now. I have a tenant on one of my lots that came Saturday. Left his trailer and went back to Canada. Going to stay for a year I expect even more???? I hired the first male nurse for pediatrics back many yeards ago whern Katherine was still in practice. Nurse practioneer also was one of the first for the ped. group. One of the Dr.I hired his wifes father was a DO. what ever forgot but she never talked about it. I have KA Pro. I have used now for year or so. Tough to get bread the way I like the feel with it. Really can not say I ever have had a good loaf. You got more time on the rise! That Spelt sure does have interesting properties. I will investigate it more if I can get back to Europe if a certain volcano will let me. My spelt ran out a long time ago. Rye and Dinkel. Lovely! Correction. Found some spelt flour. I'm back to experimenting earlier than I thought! Just wondering if you're still stuck? My husband has classmates stuck in Europe right now. I don't know much about what's going on but it sounds nasty. Was the volcano in Iceland? It's causing ashes over how much of Europe? Doc Tracy's Recent Blog Entries. And some days you should-Volkornbrot! !